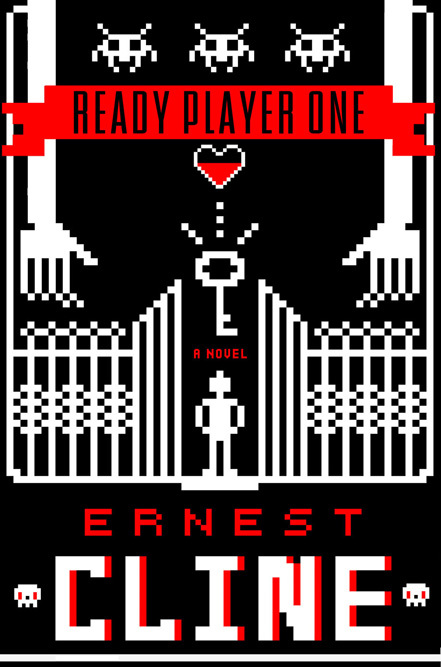 As I have been doing the rounds of conferences and workshops, and nattering on about video games and literature, people have repeatedly told me that I should read Ernest Cline's Ready Player One. So, since I'm now enjoying the vacation (or what passes for it), I just have. If you know your 1980's pop-culture and have fond memories of joystick bashing in coin-op arcades, you're probably going to find it an enjoyable romp, viewed through the dayglo spectacles of retrospect. The novel's plot is a rudimentary quest narrative, focusing on a hidden prize that lurks within the game world of the Oasis, which is a kind of mashup of various online role playing games. To discover the lucrative reward, players such as our hero, Parzival, need to have an intimate knowledge of the geekish 1980's obsessions of Oasis's programmer, Jim Halliday (a thinly disguised version of Steve Jobs or Bill Gates). As a consequence of this structure, every page hums with intertextual knowingness: when you spot that a line of dialogue is lifted from Back to the Future, or recognise the in-joke about the Dungeons of Daggoroth, of if you already knew that you could pause Pac Man by nudging him into a corner, you'll get that little buzz of pleasure that comes from being on the same level as the author. It's not surprising that the book has become a hit, appealing to an age when every cult film and video game has its own Wiki, and trivia is the currency of Buzzfeed and Reddit. My surroundings made me feel like I was in a low-budget sword-and-sorcery flick, like Hawk the Slayer or The Beastmaster. Roaming the halls unnoticed, I decided that I enjoyed having a secret identity. It made me feel like Clark Kent or Peter Parker. It's tempting at this point to adopt the schoolmasterly voice of the New York Times reviewer: Mr Cline would do well to learn that simile, if used repeatedly, does little more than draw attention to the artificial contrivance of the connection. What do we learn about the feelings or mind of our hero here, other than that (like that of his author, presumably), it's full of "stuff"? And that was when it hit me. Like an anvil falling out of the sky, directly onto my skull. Thinking hurts, admittedly - but rarely this much. Is this a self-mocking homage to cartoons? Or just untempered exaggeration, the novelist's equivalent of typing with caps lock on? (It's that pedantic "directly" that really narks me, as if cognitive anvils might occasionally fall from the sky but slightly miss their target.) The problem, beyond the aesthetic, is that such descriptions flatten the difference between ordinary existence, and the exuberant variety of the game world. Cline's characters exist in a constant sensory overload, whether they are being assailed by anvils in the mind in real life (IRL) or by blasters shooting at their avatar bodies (in the game). In the best cyberfiction, the fact that there is still a separation between real and virtual is all important. It's what the virtual can tell us about the real that gives cyberfiction its political edge, and elevates it from being "just" genre fiction. William Gibson's Neuromancer, for instance, treats cyberspace as both a zone of futuristic speculation, and a reflection on the structures of capitalism in his immediate present, the real. This metaphorical distance collapses in Ready Player One. Beyond a sparse description of "the stacks" - a kind of vertical trailer park in which Parzival lives when the novel opens - and vague references to global warming and an energy crisis, we get very little sense of what the real world is actually like, such that the Oasis seems neither a departure from the real, nor an aslant criticism of it. Being so obviously an address to the reader - in a science fiction which otherwise concentrates on building another, convincing world - it breaches any conviction we might have in the novel's alternate reality. It's like one of those dull but necessary footnotes in an academic textbook, that announces that henceforth future references will be abbreviated. In fact, a textbook rather than cyberfiction is perhaps the genre to which Ready Player One is best fitted. One emerges from it feeling one knows a lot more about obscure 1980s video games than one did before - and realising that one has probably seen Back to the Future a few more times than is healthy. Take it as a test, enjoy playing the game - but go off and read some better cyberfiction afterwards.